I discovered Beverly when she submitted her blog for my 40+ bloggers community page. I was immediately taken by her modern and fashionable style, which surprisingly she achieves with this formula: classic + classic + trendy. Very smart! When she revealed that almost all of her clothes are bought at mainstream stores like H&M and Gap, I knew that I had to feature her at 40+Style so we can discover her style secrets. She offers many valuable tips so be sure to check them out! Hi Beverly. Thanks for taking the time out to answer a few questions for 40PlusStyle.com. Can you tell us a little bit more about yourself? I’m a small business owner, wife, and mother of two awesome teens. I enjoy dark beer, dark coffee, and dark chocolate. I’m a native Californian, have never met a Jonathan Adler product I haven’t liked, and use the word “Dude” way too much. My introduction to blogging was with my first blog, Style Underdog. That’s where I fell in love with the blogging community. Can you tell us a bit more about your blog Beverly Like Hills? It’s a simple outfit of the day blog. I wanted to share my love of clothing with like-minded women. Not very many people in my surroundings would understand the excitement of a yellow belt placed around a leopard cardigan that you purchased 3 years ago from Target. In the blogging community, not only do the women understand, they offer more creative combinations. My own: pattern mixed cocktail, preppy gone rogue, a mature edge, D) All the above. I have been very impressed by your outfits which all look, fresh, modern and hip and often colorful. What is your secret? HA! I have no secret. Most of my outfits consist of classics; oxfords, crew neck sweaters, ankle length pants, blazers, a trench. 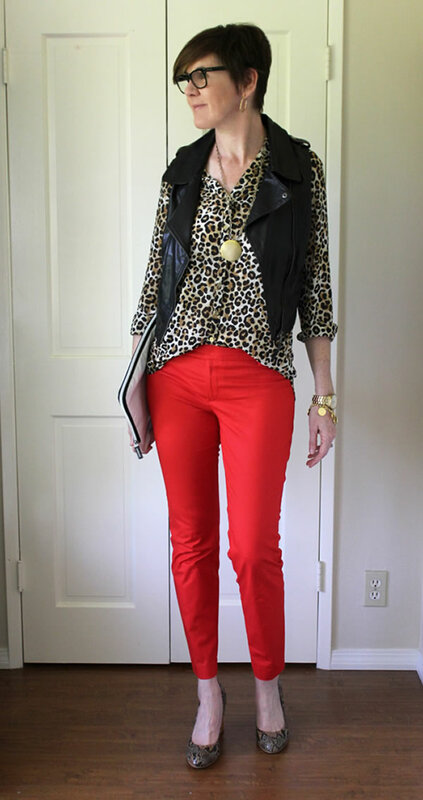 I usually try and add one piece that is “of the moment”; floral pants, polka dot blouse, a colorful blazer. 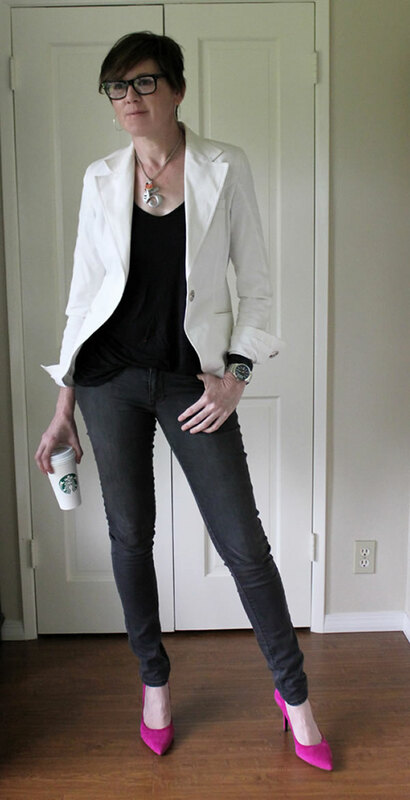 That usually adds enough tension in the outfit to elevate it from ordinary. Maybe that’s my secret, Beverly like Hill’s rule of threes: classic + classic + trendy. You recently highlighted in an article that most of your clothes are bought in mainstream stores like Macy’s, JCrew, H&M, Target, Gap & Zara? Why do you prefer to buy at these brands? These brands are like Starbucks, I know what to expect when I walk in the door. I also know how things will fit me. The clothing usually has clean lines and I can purchase items that will last for more than one season. They also feature trendy items, but with the volume turned down, so you aren’t stuck with something that screams “I’m on trend’. These stores are also geographically favorable and easy on my pocketbook. What in your opinion are the most important factors to look out for when shopping at these brands? What is the formula to for still looking unique as you do? Know your closet and do your research. Do you have your basics covered? 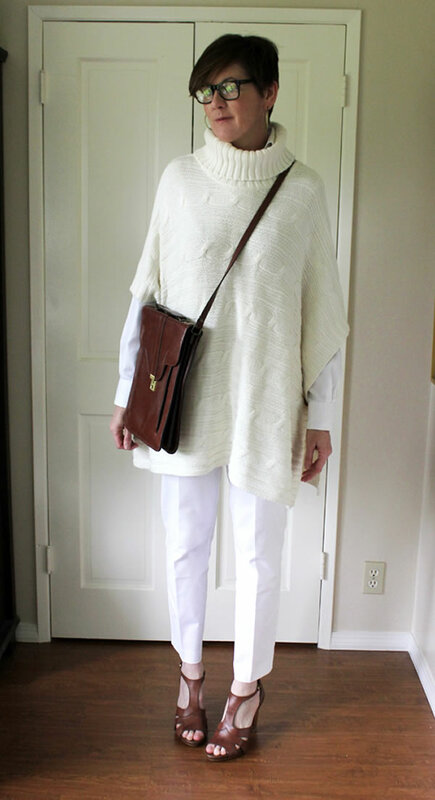 On my former blog, I was only wearing neutrals. As color became to dominate in the shows and magazines I was able to purchase a few colorful items to bring my neutral wardrobe into the now. Once the basics are covered, take a look at other blogs, street style sites, and the latest runway shows so you know what colors, textures, and lengths will be “in”. When you’re shopping, have a plan of what you are looking for: color, shape, etc., otherwise you may fall victim to the underpriced clothing candy. Am I correct that you are mostly dressing for work? What do you think are the elements of a good work outfit? I really don’t know if I can answer that question. My job is a creative one so I have a lot of play in my wardrobe. However, I do follow my newly discovered BLH rule of threes 🙂 I usually dress for whom I’m meeting with on that day and how many Mother errands I’m running, so it can vary. I always include heels, (emergency flats in my bag when cobblestoned pathways are on my agenda) and my computer. Can you tell me where you live and what distinguishes your regional style to that of the rest of the world? I’m from Southern California and I live in a weather bubble where everyday is basically a nice day and we don’t have any extremes. I’m right in the middle of laid back California style, shoes optional. I’m surrounded by distinct styles. Above me are “Housewives of Orange County” types. Below me is the low-key beach and surf community. To the right are 20-something hipsters and to the left is a military base. However, all carry that same casual vibe that you would expect in Southern California. It depends on the day. Sometimes color, sometimes a pair of shoes, and sometimes another blogger. The other day, Alyssa was wearing a great pair of pink pants and Deborah was rocking the perfect sleeveless blazer. The next morning I wore a combination of both. I also like to create weekly themes to give my closet some focus. I’m waiting to create a Jenna Lyons week or a “Kendi at 45” theme. Would you say you have a signature style? And if yes, what are the main elements? Yes, I would say I have a signature style, Beverly like Hills rule of three (I think I’m going to trademark that!). I believe we all do. As my situation in life has changed, so has my style. The older I get, the braver I become. I’m more secure with myself and how I look and what I’ve accomplished. You can also throw in a dose of 40 year old wisdom. I’m willing to try things I wouldn’t have in my 30s. What works for some at 40 may not work for others. I wouldn’t call that age appropriate as much as good styling. I’m also don’t show a lot of skin. That has more to do with my level of modesty than my age. I’ve had the same interest in all of that since I was 16. Once I started working, I had the disposable income to create my own looks. I’ve been developing my style since then. I don’t think I’ve stopped. How I look is as much a language as what I say. Which outfit from your site is your favorite outfit and why? Yes. I’m looking forward to non-traditional pencil skirts, mixed material pieces and leather everything. I haven’t found the right circle skirt, but that’s not from lack of trying. Be brave and take risk. We are not invisible. Walk around like you own it, because you probably do. What’s the worst that could happen, a horrible outfit? Note from Sylvia: Thanks so much for your wonderful replies Beverly! Be sure to check Beverly out at her blog: Beverly Like Hills. I loved this interview. I really enjoy Beverly’s style and her take on things. Loved this interview. Beverly sounds like me! Thanks for sharing Beverly’s style, it’s amazing! 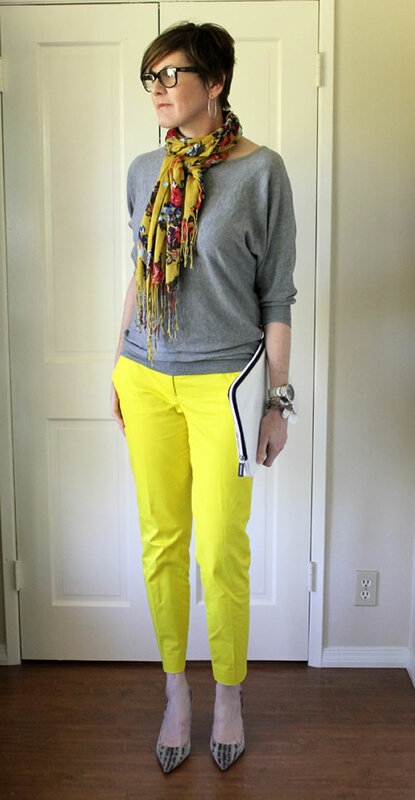 I have to say that I love the way she rocks those bright yellow pants. Sometimes I think twice before going wild with colors and patterns. It was great finding inspiration in such a confident person. What a great sense of style. Love it. Thanks for sharing. Wow, cool! Another stylish lady! I love her style! She is so stylish and looks great in all her outfits. Beverly is very sharp and stylish and love the shoes. Off to check out her blog. Love her edgy & youthful style! I could def see myself in her outfits. Great interview! Marvelous feature! Beverly rocks. She used to blog in the past- and when she stopped, there was a void. She has such GREAT style- she owns it. I love how she makes “regular” clothes look hip, modern and fresh. No wonder you love her Sylvia. You both do modern so well! Fantastic Interview Slyvia, thanks for sharing. I am now following her blog! Thanks Sylvia so much for introducing us all to Beverly! I absolutely ADORE her style!! What I really appreciate about her look – it is stylish, hip and contemporary, without a trace of someone chasing their youth. Her look is totally approachable and fun. Oh gosh… she is good!!! Loads of things she says, apply to me as well. I just think she does a hell of a better job in styling. I am definitely going to follow her. 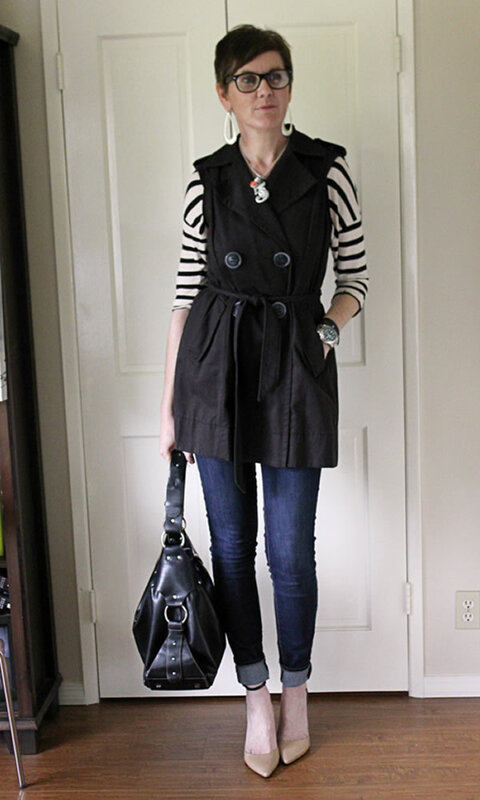 What great style….so effortless and pulled-together. Looking again just now – I think Beverly’s terrific haircut is contributing a lot to her great style! I was out running errands today , and happened to see an attractive, tall, 40 ish woman ( who had the potential to look fabulous ), but her stiff, coiffed, haircut was dreadfully outdated, and dragging her overall look down like an anchor thrown overboard. Thanks for putting her on my radar. I’m crazy about her style. She’s fresh, colorful and I can take a lot of inspiration from her. Fabulous Sylvia! This was an outstanding interview. Wow she’s got legs! Enjoy her style, fits her body very well. H&M and Zara offer some real gems but one has to be discerning to spot them. Zara shoes, some look good but upon close inspection, not well made for the price. Beverley is a rock star 🙂 I admire her wearing heels at all possible times and her hair is so stylish she could be in a bin bag and look great at all times. I am enjoying so many of the featured guests. Now I need to step out of my drab, habit, uniform and add a bit of vavoom. Thanks for your feedback Natalie and your first comment at 40+Style. When you find your vavoom, I hope you share your style with us! What a great interview. I’ve been following and commenting on Beverly’s blog the last few months. Enjoyed learning more about her! My one problem with Beverley’s blog is that she makes me want to throw out my whole wardrobe and start again. I love her taste in prints, too. One of my favourites. Eek! Beverly looks so great. I am freaking out over her shoe collection! Such a fun interview! I love Beverly, her blog and her style! I found her from your over 40 blog roll and has kept reading and commenting on her blog ever since. I love Beverly’s clean casual chic style which is just perfect for her! She looks so confident in what she is wearing and knows how to combine her clothes with fabulous shoes, bags and accessories. I really love her outfits! The one thing that I don’t love (because the outfits are all pretty fabulous) is the pigeon-toed stance that really does make her look as if she’s trying to be 23. I don’t know why young girls want to look pigeon-toed (if they think it makes their hips look narrower, they’re wrong) and I understand even less why a confident, mature woman would want to. Unless she has a musculoskeletal problem, in which case I am a jerk.